Posts (or dowels) can generally be divided into two main subgroups, depending on how retention is achieved. Active posts derive their primary retention directly from the root dentine by the use of threads. Passive posts on the other hand gain retention as their name suggests by passively seating in close proximity to the post hole walls, and rely primarily on the luting cement for their retention. Each post type can further be subdivided according to its general shape, that is whether it is tapered or parallel sided. In general, active posts are more retentive than passive posts of a similar configuration, and parallel-sided posts are more retentive than tapered posts. Post choice should therefore be dictated by each clinical situation. Whilst active posts engage the root dentine with threads, they must always be cemented with a luting cement. This not only provides retention secondary to the threads, but is essential in creating a bacterial tight seal along the post length. Threaded (active) posts can be categorized further into self-threading or pretapped systems. Passive posts can either be custom made and cast in gold or non-precious alloys, or bought as preformed posts around which a core is built in the mouth or cast onto in the laboratory. Such posts can be tapered or parallel sided, and smooth or serrated. In a classic case one of the best design for a post to decrease the risk of failure is the narrowest & longest smooth, parallel post that one can fit into the post space. Utilizing the longest possible post ensures that the forces transmitted from the crown are distributed over as much of the root as possible. Using the appropriate diameter post ensures that as much natural tooth structure as possible is left to support the post and absorb the transmitted forces. 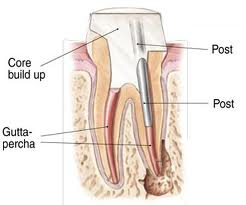 A parallel post ensures the greatest retention of the post within the canal, and is perhaps utilized with only the slightest loss of tooth structure to the internal wall of the canal. A smooth-surfaced post, although less retentive than either serrated or threaded post surfaces, transmits the least amount of force to the root structure. While both smooth and serrated posts are passive, in that they simply lie within the post space after being cemented, threaded posts actively engage the internal walls of the root canal as they are screwed in, and, while being the most retentive by far, produce such a force on the brittle root structure that they are contraindicated in most situations. 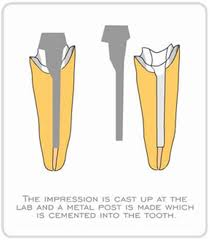 The use of a post and core does not strengthen the tooth prior to restoration with a crown; rather, it may contribute to the weakening of the tooth structure, as the forces placed upon the future prosthetic crown and core are now transmitted along virtually the entire length of the brittle, endodontically treated tooth. This inherent drawback is taken into account when the prognosis of the finished restoration is determined and explained to the patient prior to the onset of treatment. It is because of this increased risk of failure inherent in the use of post and core restorations that, when all of the independent failure rates of the many procedures needed for the restoration of the tooth are considered together (endodontic treatment, crown lengthening (when indicated), post and core & prosthetic crown), the patient is sometimes advised to have the tooth extracted and an implant placed. The post with additional single-circle ring increases the contact surface area between the core and involved hard tissue of tooth significantly, therefore this system does not require a post with at least 2/3 of the root canal depth as its indication. All post space preparations should be clean, free from saliva and bacterial contamination and dry before the post is cemented. 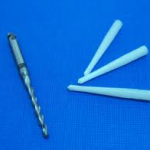 Use of the air from the three-in-one syringe may not be sufficient to dry at the apical region of the post hole, therefore after air drying, an absorbent paper point should be used. 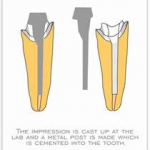 The actual method of post cementation is critical to ensure complete seating within the post space and that the luting cement adapts completely to both the dentine and post, thus completely sealing the interface between the two. The complete seating of the post can be ensured by measuring the prepared post space length with an endodontic instrument or periodontal probe and confirming that the post is inserted by the same amount. 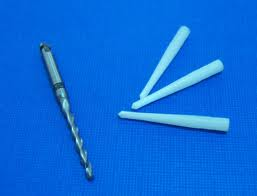 Cementation techniques include placing cement lute over the post and/or placing it in the post hole with a lentulo-spiral, paper point or an endodontic explorer. The most successful method was to place the cement into the post hole with a lentulo-spiral and coating the post before inserting with a gentle pumping action to allow adequate venting of the post coronally. If the cement is applied to the post alone a reduction in retention is observed. Modifications to this technique will also depend upon what luting cement is used. This entry was posted in Dental Crowns, Endodontic treatment and tagged active post, crown, crown lengthening, Endodontic treatment, luting cement, parallel sided, passive post, post and core, post cementation, pretapped systems, self threading systems, serrated, smooth, tapered on June 11, 2012 by chzechze.